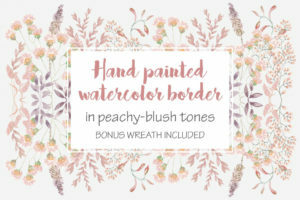 Watercolor border of mixed pansies; bonus card template. These hand painted watercolor pansies come straight from my spring garden. The artwork has been been executed in fantastic detail. The listing is for a dainty watercolor clip art border of multi colored pansies. Perfect for all types of cards. Also ideal for scrapbooking, decoupage, logos, labels etc. Your purchase includes a page / card template in a pansy swirl design. The template is in the landscape orientation. This design complements the pansy border, making this a great value for money purchase. The card template reduces perfectly to a 7 inch X 5 inch card size. The page / card template measures 10.5 inches X 7.5 inches (3150 X 2250 pixels). 1 zipped folder is immediately available following purchase containing both the border files and the card template files (JPEG and PNG) – 4 files in total.